Today, I want to tell my friends about the history of the correspondence department of the Promised Messiahas so that they can realise how particular Huzooras was in replying to his followers. 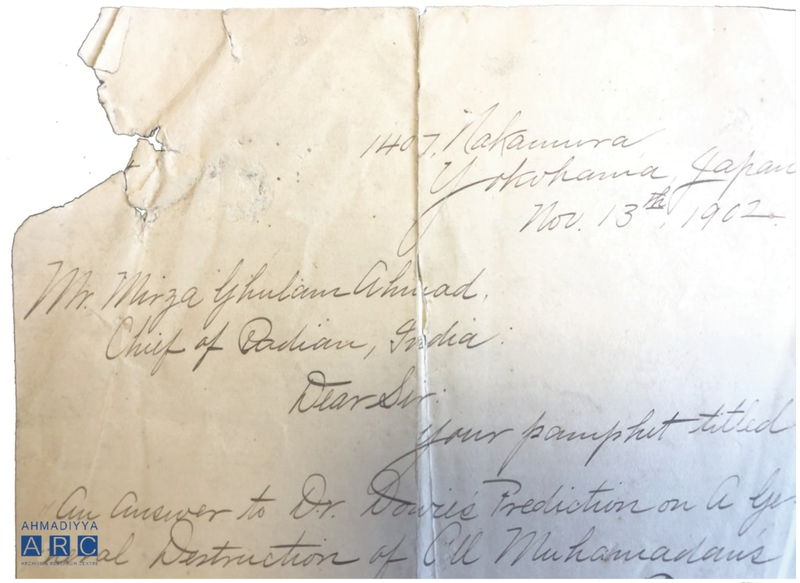 Before he had made any claims and was working on Barahin-e-Ahmadiyya, Huzooras would reply to letters himself. He would use a reed pen and locally manufactured ink and would write on a thin French paper. Such letters, with the detailed spiritual and theological contents therein, turn out to be a piece of literature in their own capacity. This was the case for a long time until Munshi Abdullah Sanori Sahibra and Sahibzada Siraj-ul-Haq Naumani Sahibra started to visit Huzooras who would write replies on his behalf. As this work of correspondence expanded and Huzooras, by divine commandment, made his claims public, letters started to pour in in much greater number. Even then, the Promised Messiahas would personally reply to some dear ones (a practice that he maintained till the last breath of his life or theirs), albeit a single line or two. When Huzooras posted books or other literature to some of his followers, he would wrap the parcels, write the address and place the postal stamps himself, with great love and care, before sending them off via registered mail. I intend here to only touch upon this briefly, without going into detail. After his claims were made public, the Promised Messiahas became very busy and the number of letters only increased; replying to them personally became no longer possible for him. It was then that Hazrat Maulvi Nuruddin Sahibra, Hakim Fazl Din Sahib and, occasionally, Mirza Khuda Bakhsh Sahib, started to help in writing replies. When Hazrat Maulvi Abdul Karim Sahibra migrated and settled in Qadian, this duty was permanently assigned to him, with Pir Iftikhar Ahmad Sahib as his assistant. He [Pir Iftikhar Sahib] would reply to letters requesting prayers or Bai‘at and other letters of general nature himself as a set format. Replies to letters of special or specific nature would be written by Hazrat Maulana Abdul Karimra. A great feature of Hazrat Maulvi Abdul Karim’sra time in this service (which ceased with his demise) was that he would issue a weekly circular with the latest revelations, excerpts from various talks of the Promised Messiahas and other enlightening and faith inspiring incidents. 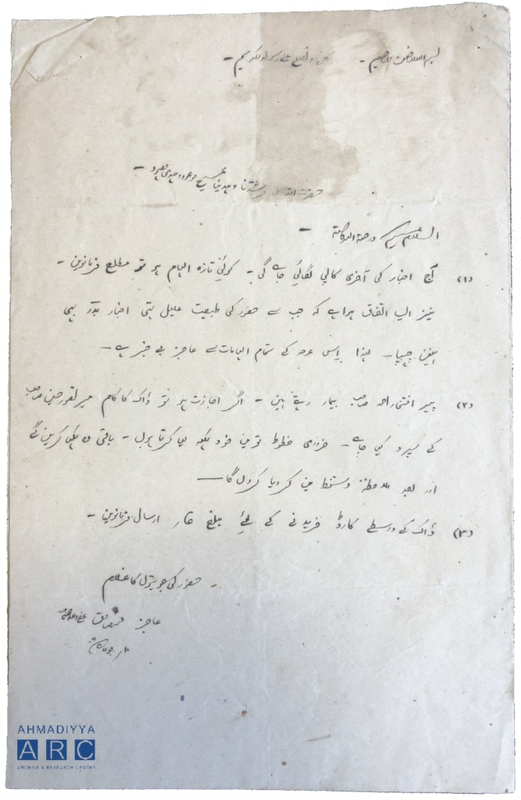 These circulars were sometimes addressed to Hazrat Munshi Taj Dinra with the instruction to read it out to the local Jamaat and then send it off to Sialkot. Some would be addressed to Hazrat Mir Hamid ShahSahib with a similar instruction to forward them. Hazrat Maulvi Abdul Karim Sahibra had, owing to his great intellect, sensed that the only way to develop a personal connection with the Promised Messiahas was to regularly write to him. Maulvi Sahibra sowed the seed of desire in the Jamaat’s heart to write frequently to the Promised Messiahas. As he came across many letters requesting prayers, Maulvi Sahibra would also give tips on appropriate ways to request Huzoor’sas prayers. Extending this practice further, Maulvi Sahibra would write such information for Al Hakam every week. After the demise of Hazrat Maulvi Abdul Karim Sialkotira, this duty was passed on to Hazrat Mufti Muhammad Sadiq. Mufti Sahib had occasionally helped with this duty in the past, but it was after the demise of Maulvi Sahibra that Mufti Sahibra was assigned this duty. He served in this capacity until the demise of the Promised Messiahas. It was the practice of the Promised Messiahas that … he would read all the letters himself. Before the envelopes were opened, the whole bundle of the mail would be brought to the Promised Messiahas, who would place it before himself and pray to Allah generally to fulfil the desires of all those who had written to request prayers in various matters. I cannot say what the exact words were, but they would be similar in meaning. The Promised Messiahas mentioned on many occasions that when letters arrived, he prayed for all those who had written him. He would then open each letter, read it and pray according to the writer’s request. Having read all letters, he would hand them to the scribes when he came for the Zuhr prayer. On days when the correspondence came after Zuhr, he would bring them out at Asr. The letters would be in Huzoor’sas pocket, tied in Huzoor’s handkerchief during Salat and so he would pray for them during Salat. The correspondence department would then prepare a list of all those who had requested prayers through these letters, hence another opportunity for Huzooras to pray for them in his special moments of supplication. Replies were then written stating that Huzooras had prayed for them. In the replies that Huzooras wrote himself, he would always use a respectful salutation for the addressee, whatever their social status, like Akhwim (my brother), Hibbi Fillah (my brother in Islam) or Mukarrami (respected). It was not his practice to address anyone with their name only. Huzooras would always use an honorific prefix and address them in second person plural [seen as more respectful in Urdu]. Such examples can be seen in the few volumes of the Promised Messiah’sas letters that I have published and others that are being published in Al Hakam. As gratitude for Allah’s bounties, I would like to say that the blessing of publishing this hidden treasure of letters has been bestowed upon me. Praise be to Allah! Concluding this essay, I request that if anyone has, in their possession, any letters of the Promised Messiahas, they may send it to myself – the original or a copy – so that I may publish it and both of us can earn a reward from Allah.